Thailand’s Nok Air plans to pursue rapid growth of its international network in 2H2015 with new services to China, Vietnam and Singapore. Its joint venture medium/long-haul LCC NokScoot is also planning to commence new routes to China and Taiwan by the end of 2015 as it will likely not be able to launch long planned services to Japan and South Korea until 2016 due to regulatory restrictions implemented by these countries on Thai carriers following Thailand’s failure of an ICAO safety audit. Nok strategically needs to expand in the international market, where it now has a relatively limited presence. But it will have to overcome competition from LCCs already serving the Thailand to China, Singapore, Taiwan and Vietnam markets. This is Part 1 of a two-part series of reports on the network expansion plans of Nok and NokScoot. This part will focus on expansion by both Nok-branded carriers in China and Taiwan as well as Nok’s plans for taking over NokScoot’s Bangkok-Singapore route. The second part will focus on Nok’s plans for expansion in other Southeast Asian markets, in particular Vietnam, and continued expansion in the Thai domestic market. Nok Air currently operates a fleet of 24 aircraft to 24 domestic and four international destinations. The fleet currently consists of 18 737-800s in 189-seat single class configuration, four 86-seat Dash 8 Q400 turboprops and two 66-seat ATR 72-500s. Nok’s only scheduled international service is from Bangkok to Yangon, which was launched in late 2013 and is being increased in Sep-2015 from 14 to 18 weekly frequencies. Nok began serving four China routes over the last few months – Bangkok-Hefei, Bangkok-Nanning, Krabi-Chengdu and Phuket-Chengdu – but these are all currently operated as regular charters. NokScoot, the Thai-Singapore JV, currently operates a fleet of three 777-200s in 415-seat two-class configuration but only has two routes – a four times per week Bangkok-Nanjing service and a temporary four times per week Bangkok-Singapore service which is being dropped in 16-Aug-2015. NokScoot’s fleet has been significantly underutilised as it has been unable to implement plans to launch services to Seoul, Osaka Kansai and Tokyo Narita after Korean and Japanese authorities blocked all new services from Thai carriers in Mar-2015. NokScoot CEO Piya Yodmani will be speaking at the CAPA LCC Airports Congress in Bangkok on 15-Sep-2015. For more details on the event click here. NokScoot is not planning to consider additional aircraft commitments until the Thailand DCA resolves ICAO’s concerns, enabling Japanese and South Korean authorities to lift the current ban on new flights from Thai carriers. But NokScoot will be able to expand its network in 2H2015 by improving utilisation of its existing three 777s, although it does not expect to be able to launch services to Japan or South Korea until at least 2016 as the concerns initially raised by ICAO in early 2015 remain unresolved. Nok is planning to add four aircraft in 2H2015 and another four aircraft in 2016, enabling it to expand its limited international network and continue to expand its domestic operation. 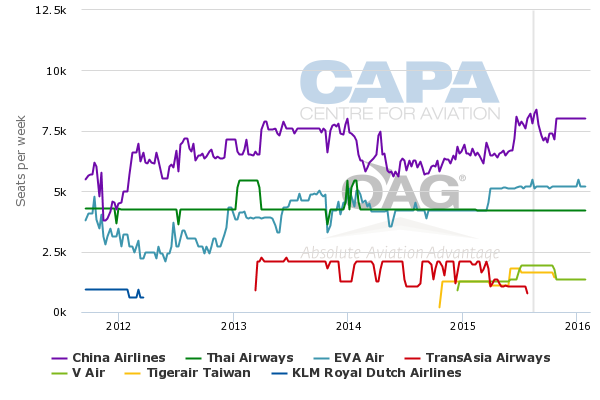 Nok Air CEO Patee Sarasin told CAPA on the sidelines of the 6-Aug-2015 CAPA Australia Asia Pacific Aviation Summit in Sydney that expansion of the group’s international network over the last four months of 2015 will include at least four more cities in mainland China, at least one city in Vietnam and Taipei in Taiwan. He said Nok Air also plans to launch 737-800 services on the Bangkok-Singapore route in Nov-2015, replacing the 777-200 service which will be operated by NokScoot until 16-Aug-2015. The new China destinations include three destinations which will be served by Nok Air using its 737-800 fleet. This will increase the Nok network in China to a total of six destinations. Mr Patee said NokScoot is also planning to launch services within the next few months to Beijing and or other destinations in northern China. Hangzhou, Qingdao, Shenyang and Tianjin would be logical destinations for NokScoot from Bangkok as they are or will soon be served by Scoot. Significant synergies can be leveraged by having both medium/long-haul LCCs serve the same destination. Both Scoot and NokScoot already serve Nanjing. The Nok group strategy is to use Nok to serve destinations in southern, central and eastern China that are within a four-hour flight of Bangkok while using NokScoot to serve destinations in northern China which are more than four hours from Bangkok. This follows a similar strategy to that of AirAsia and AirAsia X, which combined serves 13 destinations in mainland China including seven from Bangkok. Thai AirAsia also operates three routes to mainland China from Chiang Mai in northern Thailand and one route to mainland China from Krabi. Nok is keen to expand in China as it sees fast-growing demand in the Thailand-China market. China is by far the largest source market for Thailand’s tourism sector, accounting for 4.6 million visitors in 2014. Visitor numbers from China were roughly flat in 2014 due to the civil unrest in Bangkok but through the first five months of 2015 have nearly doubled. Thai AirAsia now accounts for about a 12% share of total seat capacity between China and Thailand and more than a 50% share of LCC capacity. AirAsia will continue to expand in the Thailand-China market with new routes planed for both Thai AirAsia and new medium/long-haul affiliate Thai AirAsia X, which does not yet serve China. But the upcoming expansion at the Nok group will be much faster, enabling it to narrow the gap with AirAsia and other competitors. The expansion at Nok is also strategic as rival Thai Lion is also planning to enter the Thailand-China market within the next few months. Mr Patee told CAPA that Nok will be working in the near future on building up its brand across China, which should help the carrier support a much larger Chinese network. Nok is a relatively unknown brand in China as until now it has been almost entirely a domestic operator. Mr Patee also sees opportunities in the outbound market from Thailand to China as more Thais start to holiday in China. The Nok group is not currently able to tap into this market except with Nanjing and Hefei, which are the only Chinese destinations now sold on the NokScoot and Nok websites. Nok is not currently able to sell Chengdu or Nanning as these flights operate entirely as charters. But the airline aims to transition all its charters and scheduled charters between Thailand and China to normal scheduled services as soon as possible, which will facilitate sales at the Thailand end and also open up website sales in China. With charters the bookings are entirely controlled by Chinese agents. Nok expects to continue to rely on agents to generate most traffic on Nok and NokScoot routes from China but the ability to sell on other channels provides important incremental traffic which could make the difference between a break-even and profitable route. NokScoot is able to operate Nanjing as a scheduled service, which it launched in 11-Jun-2015, but is still awaiting approvals from Chinese authorities to add more routes to China. While Chinese authorities have not followed their counterparts in Japan or South Korean in implementing a blanket ban on additional flights from Thai carriers they have implemented in recent years restrictions limiting the rate of expansion on all new foreign carriers. NokScoot therefore has to complete a certain number of sectors outside China before it can launch a second route to China. NokScoot expects to receive approval to expand in China once its last flight to Singapore operates on 16-Aug-2015. NokScoot has been serving Singapore since 20-May-2015, initially as a daily flight and as a four times per week service from 1-Jul-2015, giving it enough sectors to in theory meet the Chinese requirement. NokScoot would likely not have launched Singapore if it did not need to build up sectors to meet operational experience requirements from China. It also would not have launched Singapore if it had been able to launch services to Seoul, Osaka and Tokyo as originally planned. Bangkok-Singapore is a more appropriate route for Nok as NokScoot has struggled to fill up its 415-seat 777-200 on the two hour flight to Singapore. While Scoot operates Bangkok-Singapore with 10 weekly flights it is the only widebody LCC in the Bangkok-Singapore market. The market is currently served by three short-haul LCCs – Jetstar Asia, Thai AirAsia and Tigerair – with five to six daily frequencies each. 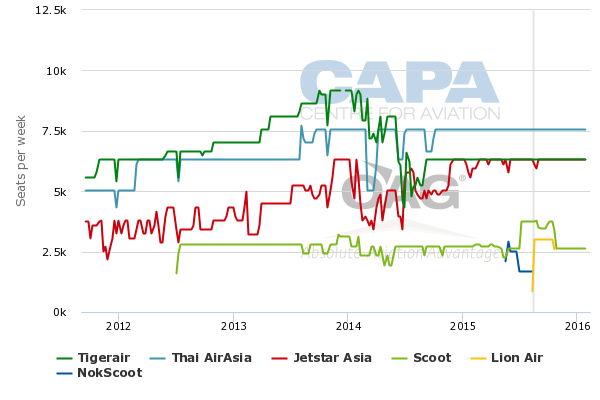 As CAPA has previously described, Thai Lion plans to launch Bangkok-Singapore service on 15-Aug-2015 with one daily 737-900ER flight. Nok is also planning initially to serve Singapore with one daily 737-800 flight with an early morning departure from Bangkok Don Mueang and an early afternoon departure from Singapore. This essentially uses the slots that NokScoot has been using for its Bangkok-Singapore service. It is also similar to the schedule that has been filed by Thai Lion. The early morning departure from Bangkok is ideal for sales in Thailand but will likely see limited demand for passengers originating in Singapore. Nok will mainly be focusing on sales to Thais, which remain the main target for Nok even as it expands its international network. As in the case with China, Nok does not have a widely recognised brank in Singapore. Nok is optimistic it will see sufficient outbound demand in the Thailand-Singapore market as well as outbound demand for destinations beyond Singapore that are operated by Scoot to make Bangkok-Singapore viable with 189-seat 737-800s, which have less than half the capacity provided by NokScoot’s 777-200. Nok’s new Bangkok-Singapore and Singapore-Bangkok flights will operate at a different time of the day from any of the Scoot flights on the route, opening up different connections beyond Singapore and enabling passengers to connect in both directions in markets that now only have convenient connections in one direction. Nok does not yet sell Scoot-operated flights, except Scoot flights to and from Bangkok, but expects to start selling Scoot connections beyond Singapore by the time it launches flights to Singapore in Nov-2015. Scoot already sells Nok-operated flights beyond Bangkok. For Nok to generate significant connection volumes beyond Singapore it will likely need also to codeshare with Singapore-based short-haul LCC Tigerair, another part of the SIA group. Adding Nok to the current interline partnership between Scoot and Tigerair and the joint venture between the two carriers in the Singapore-Bangkok market would be logical and could enable Nok to add capacity to Singapore over time. But a Nok-Tigerair partnership is surprisingly not currently under consideration. With just the one flight Nok will only be able to capture about a 5% share of LCC seat capacity in the Bangkok-Singapore market. In Dec-2015, after both Thai Lion and Nok enter the market, the Scoot and Tigerair joint venture will control about a 38% share of LCC seat capacity between Bangkok and Singapore while Jetstar will account for about a 24% share and AirAsia a 28% share. As is the case with Nok, Thai Lion will account for a relatively insignificant 5% share, potentially making it hard to compete over the long-term. Nok will be able to sell the Scoot-operated flights as the two carriers already have an interline partnership, but Nok and Scoot combined will only account for about a 19% share of LCC seat capacity in the Bangkok-Singapore market compared to 24% for Tigerair. Scoot will obviously benefit from working with both Nok and Tigerair, giving it the best of both worlds. Tigerair does not necessarily need Nok as Nok will be a small player but Nok risks being squeezed out if it is unable to also work with Tigerair. NokScoot plans to focus entirely on North Asia with services to China, Taiwan, Japan and South Korea. Hong Kong is not part of the NokScoot business plan. Australia is also not under consideration as the Nok group instead plans to rely on Scoot, which will expand its network in Australia to four destinations in Nov-2015, and offer one-stop connections in the Thailand-Australia market. Taiwan is slated to be NokScoot’s second permanent international market after China. Mr Patee said NokScoot is now working to secure authorisations for the Bangkok-Taipei route and should be able to launch services to Taipei within the next couple of months. Taiwan is a relatively small but growing source market for Thailand’s tourism sector. Thailand reported a 57% increase in visitors from Taiwan in May-2015 to 50,000. Taiwan also is starting to emerge as a popular destination for Thais. The Bangkok-Taipei market is highly competitive, with service from five carriers – Thai Airways, China Airlines, EVA Air, Tigerair Taiwan and V Air. 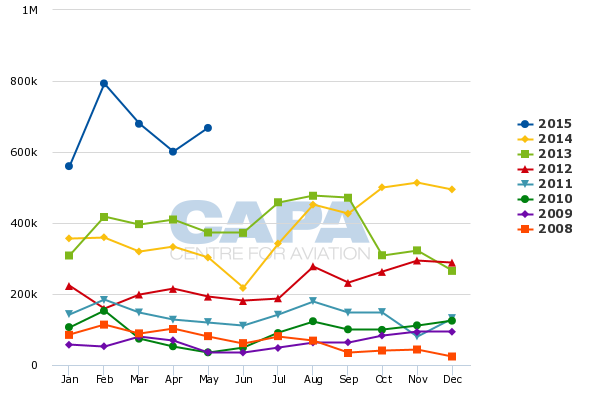 But LCCs now account for only about 17% of seat capacity in the market, leaving a potential opening for the Nok group. Thai AirAsia dropped Taipei in Mar-2011. But filling up a 415-seat widebody aircraft could prove challenging. Tigerair Taiwan and V Air, both of which only began serving Bangkok in late 2014, operate A320s. Connections beyond Taipei could potentially make the route sustainable for NokScoot. Scoot currently links Taipei with Osaka, Seoul and Tokyo along with Singapore. Scoot also serves Osaka from Bangkok, which Nok and NokScoot now sell but the two carriers currently do not offer any options for the Bangkok-Seoul or Bangkok-Tokyo markets and are still not able to implement plans to serve these routes with non-stops. NokScoot ultimately will need Japan and South Korea to open up if the airline is to be sustainable. The timing of the ICAO announcement, precluding access to those markets, could not have come at a worse time. The Taiwan and China markets alone will not be sufficient for NokScoot to fully utilise its initial three-aircraft fleet. Mr Patee acknowledges NokScoot is unlikely to secure approval for the planned routes to Japan and South Korea until 2016 as Thailand’s DCA has not yet submitted a plan to ICAO for resolving the safety-related concerns. He pointed out that Thailand’s DCA has not yet invited ICAO back for a new audit, which would be the first step in re-certifying the DCA to ICAO standards and lifting the restrictions now placed on Thai carriers by Japan and South Korea. 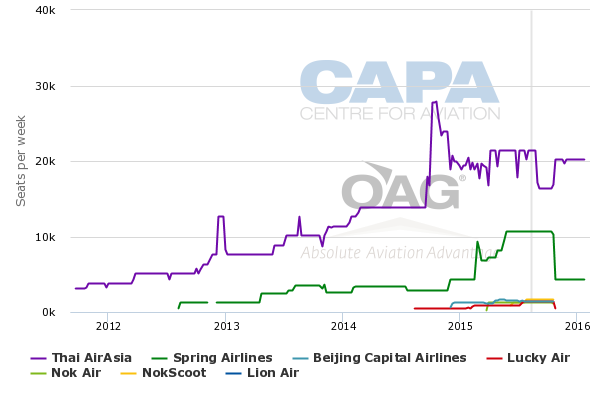 The regulatory delays has been extremely frustrating for NokScoot as they are entirely out of its control as the safety issues raised by ICAO are specific to the Thai DCA rather than any of the airlines the DCA oversees. NokScoot can only wait and hope for a quick resolution, enabling it to finally implement its business plan and enter what it considers to be its two main markets. In the meantime NokScoot will remain unprofitable. Nok Air is not impacted by ICAO’s issues with the Thai DCA as it is a short-haul carrier with no intentions of serving Korea, Japan or any other country which blocks new routes from airlines based in a country that is not in compliance with ICAO safety standards. Nok is entirely focused on China and Southeast Asia for its international expansion. Nok’s plans for expansion in Southeast Asia as well as domestically will be looked at in Part 2 of this report.